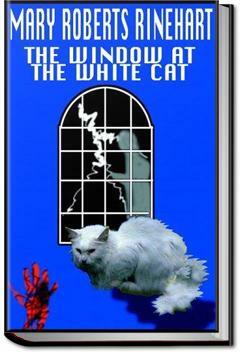 When a clumsy, well-meaning lawyer gets involved with a pair of delightful old maids and a beautiful girl, he must acquire some of the skills of his friends the detective and the newspaperman to solve the puzzle of The White Cat. That’s the name of a back-street political club serving beers, political favors and, occasionally, murder. . . .I am afraid to. Suppose he doesn't know and I should tell him! He would go to Mr. Schwartz at once, and Mr. Schwartz is treacherous. The papers would get it, too." Her eyes filled with tears, and I felt as awkward as a man always does when a woman begins to cry. If he knows her well enough he can go over and pat her on the shoulder and assure her it is going to be all right. If he does not know her, and there are two maiden aunts likely to come in at any minute, he sits still, as I did, and waits until the storm clears. Miss Margery was not long in emerging from her handkerchief. "I didn't sleep much," she explained, dabbing at her eyes, "and I am nervous, anyhow. Mr. Knox, are you sure it was only Harry trying to get into the house last night?" "Only Harry," I repeated. "If Mr. Wardrop's attempt to get into the house leaves me in this condition, what would a real burglar have done to me!" I loved this book and will DEFINITELY be reading more of Ms. Rinehart's books. Refreshing to read a book from this time period that was actually written in this time period.....all details were totally correct and no chance of historical inaccuracies, as the author only knew her own time period. This cutesy mystery was intriguing, so it won’t be my last by this new-to-me author. I disliked the use of bad language, including using the Lord’s name in vain. It’s such lazy, uncreative writing, not to mention disrespectful to one’s audience. Although I had to ignore the early- twentieth century notions of proper upper-middle class behavior and other stereotypical touches, I did enjoy this American drawing-room mystery with its endearing and somewhat bumbling lawyer turned detective and the backdrop of corruption in state politics. Spendid. Mr Jack Knox, attorney at law, falls for the beautiful young girl who walks into his office and enlists his help to find her missing father, Mr. Flemming-a polititian. But not being a detective, he also asks for the help of the detective force, and the newspaper reporters. A great Golden Age style mystery, with a sleuth using deduction and just a spice of romance to it. Easy to follow and make guesses with, but hard to guess the right answer.